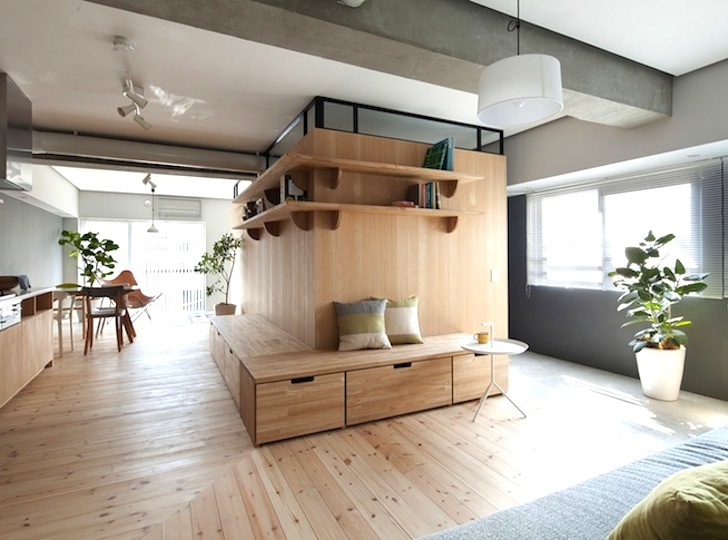 Japanese apartments are notoriously tight on space, but Tokyo-based architecture firm Sinato managed to make the most of a small footprint in their recently renovated Fujigaoka M apartment. Located within a 26-year-old apartment complex, the unit was upgraded with a modern aesthetic organized to promote the free flow of cross ventilation and natural light. The addition of a wooden L-shaped partition is the central component that spatially divides and visually unifies the different rooms of the open-plan home. Sinato fit eleven different spaces within the 689-square-foot apartment, which features a limited materials palette comprising warm-toned wood, gray concrete, and white-painted walls. The spaces are oriented towards the south wall, where large glazed doors open out to a balcony and stream natural light into the space. Glass panels were installed at the top of the wooden partitions to allow light to flow through and to maintain uninterrupted views of the ceiling, a strategy that makes the apartment feel more spacious. The two door-less bedrooms are located on the east side of the apartment and separated by an existing load-bearing concrete wall. The L-shaped wooden partition, which includes extra storage drawers and shelving, separates the bedrooms from the main communal spaces, like the dining room and kitchen. In contrast to the wood flooring on which the main spaces are located, Sinato lined the transitional areas of the apartment with gray tiles. 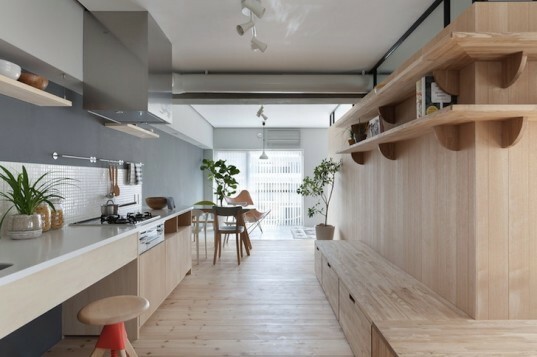 Sinato fit eleven different spaces within the 689-square-foot apartment, which features a limited materials palette comprising warm-toned wood, gray concrete, and white-painted walls. The spaces are oriented towards the south wall, where large glazed doors open out to a balcony and stream natural light into the space. Glass panels were installed at the top of the wooden partitions to allow light to flow through and to maintain uninterrupted views of the ceiling, a strategy that makes the apartment feel more spacious. The two door-less bedrooms are located on the east side of the apartment and separated by an existing load-bearing concrete wall. Plan of the Fujigaoka M.
In contrast to the wood flooring on which the main spaces are located, Sinato lined the transitional areas of the apartment with gray tiles.